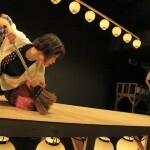 Original program have been depicted as “A drama driven by men’s chivalry” in Kabuki for a long time. On the other hand, Kinoshitakabuki switched gender of the cast. 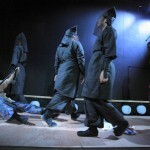 Thus the program is performed by one actor and several actresses. 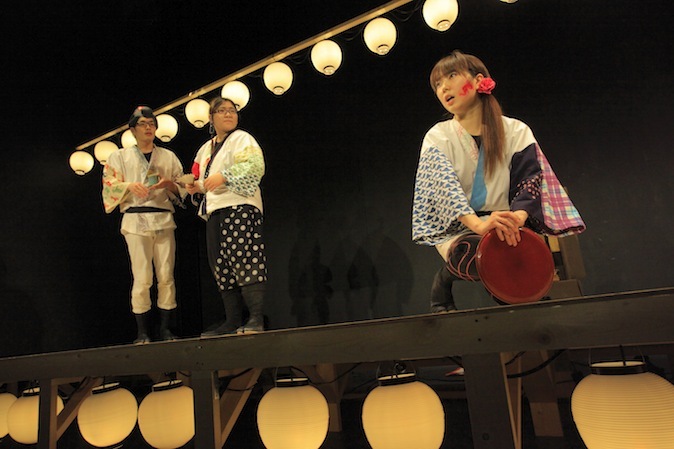 It is a query and shown statement by Kinoshita-Kabuki, against “The world based on justice and loyalty” in Kabuki, which is criticized as anachronistic. 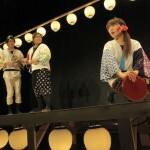 Once audiences come into the theatre, there are many food-stands and street venders runned by actors lined, and many paper lanterns are hanging from ceiling. The atmosphere is exactly like a day of a festival. In the meantime, a story starts before the audiences realized it. 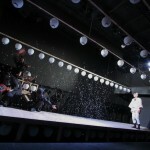 All large and small stage props are brought in and out by casts, so it goes like an amateur theatricals in a village. 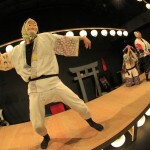 Thus, the festival, “Time of celebration” is intentionally created. 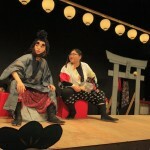 In current Kabuki programs, the incident that Danshichi the protagonist of the story kills his father in law, tend to be idealized. 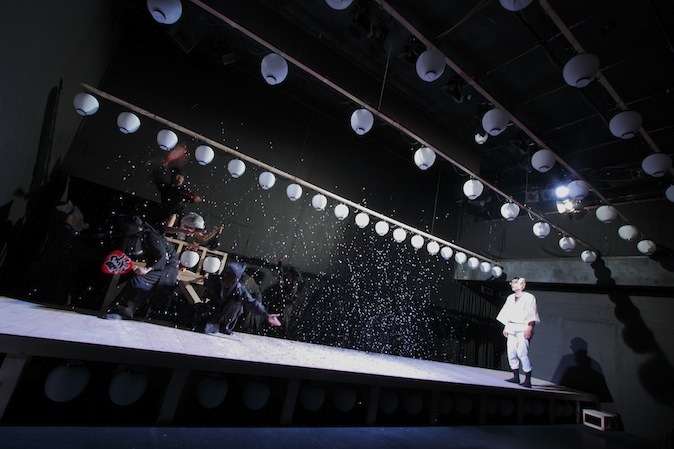 Different from popular Kabuki, Kinoshita-Kabuki emphasizes the madness and the facts in contrast to intentionally created festival-like-mood. 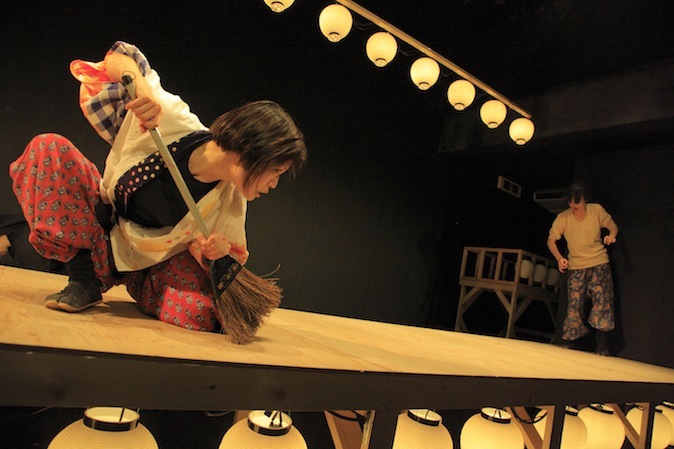 The director Momoko Shiraga performs by herself as a Kuroko during the program. 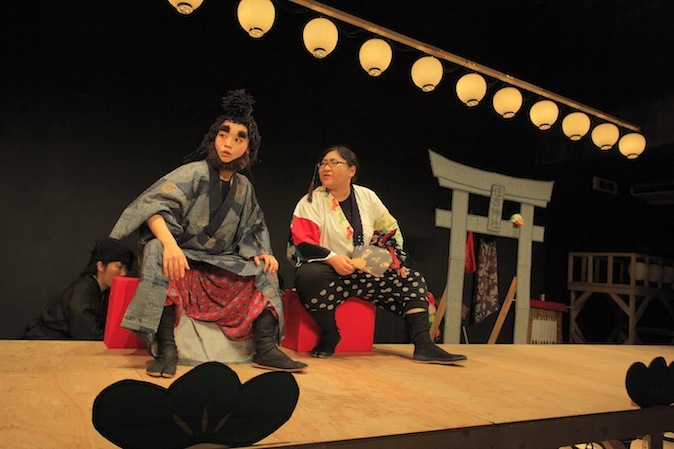 Kuroko is a peculiar role to Kabuki for support bring-in and out stage props, or actor’s cloth change on the stage. 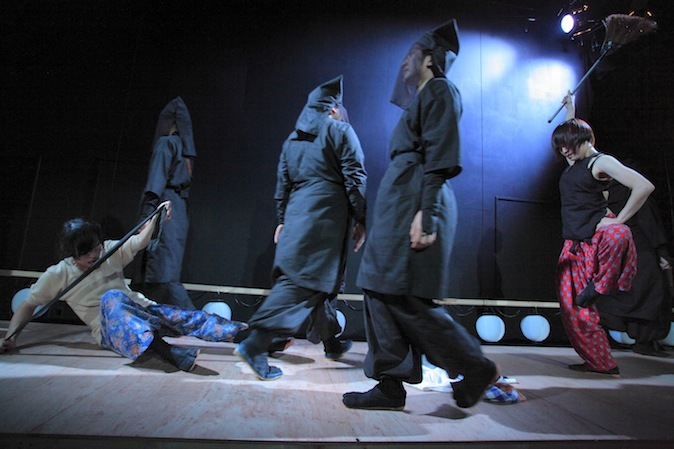 They are in black costume and works efficiently on stage, but as a tacit understanding, the existence of Kuroko is presumed to not-exist, such as “Invisible person for the audiences”. With passage of the story, cast turn to Kuroko one by one and the Kurokos are going to be multiplied. Its strange sight suggest that “Kurokos as no-existence even they exist” overlap with “People who going to be eliminated from the society” because of their out-law existence. 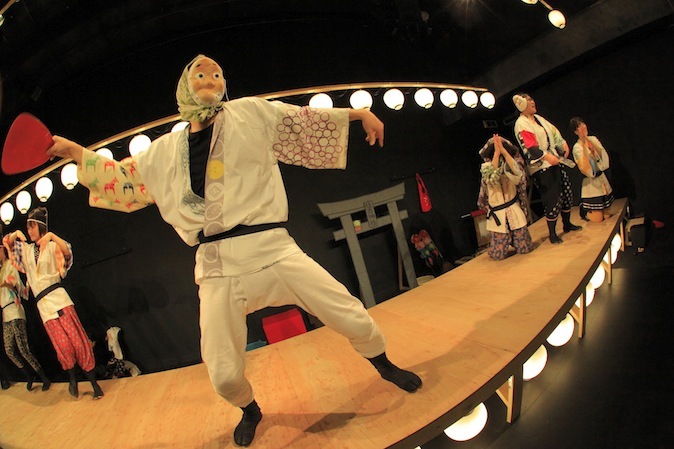 Like a present example for direction to use Kabuki’s tacit understanding critically, the director Shiraga’s “a view point towards the world” – peripheral existence of the society, persons tend to be assumed as no-significance is, in fact, more important – is sufficiently shown.